Happy National Iced Tea Day! I’ve had culinary lavender growing in a pot on my back patio for a while now, and I’ve been meaning to use it in a recipe. The simplest solution was to turn it into a sweet simple syrup for beverages. I’ll admit I am quite addicted to iced tea, so naturally I thought of adding it to a fresh-brewed pitcher. 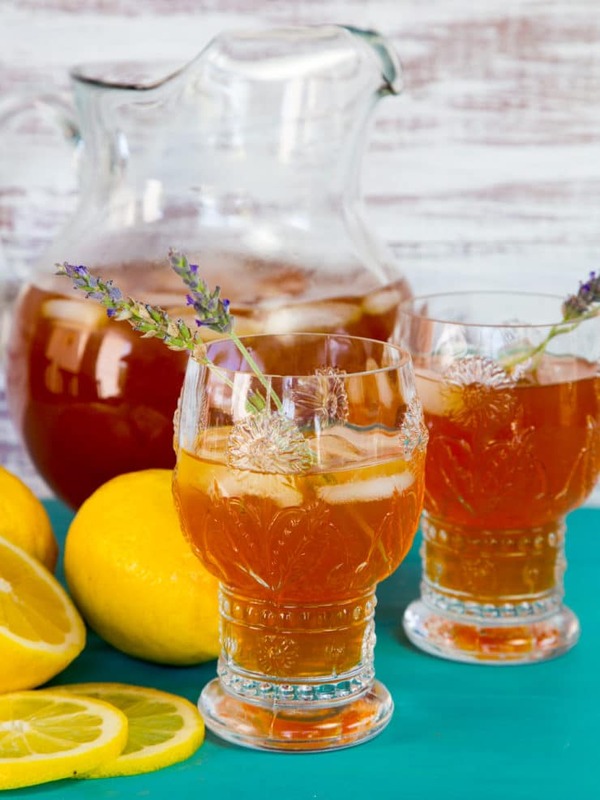 The result is this lightly sweetened, refreshing Lemon Lavender Iced Tea. I plan to drink it by the pitcher-full all summer long! Though it may seem strange to cook with floral flavors, lavender has been used in the kitchen for centuries. Queen Elizabeth I is said to have required a jar of lavender conserve (jelly) at every royal meal and drank lavender tea to stave off stress-related ailments. Queen Victoria also had a fondness for lavender; some say she is responsible for its popularity across England. She placed it in each of her rooms, used it to clean, scent the air and store between linens. Until the 19th Century, lavender was as common as rosemary is today. It’s unclear why it fell out of fashion for a while, but I’m pleased to see it making a return– especially in the kitchen. Have you experimented with lavender in your kitchen? If so, what have you made? In a small saucepan, combine 1 cup of water with the sugar and bring to a simmer over medium heat. Add lavender and continue to boil for 30 seconds. 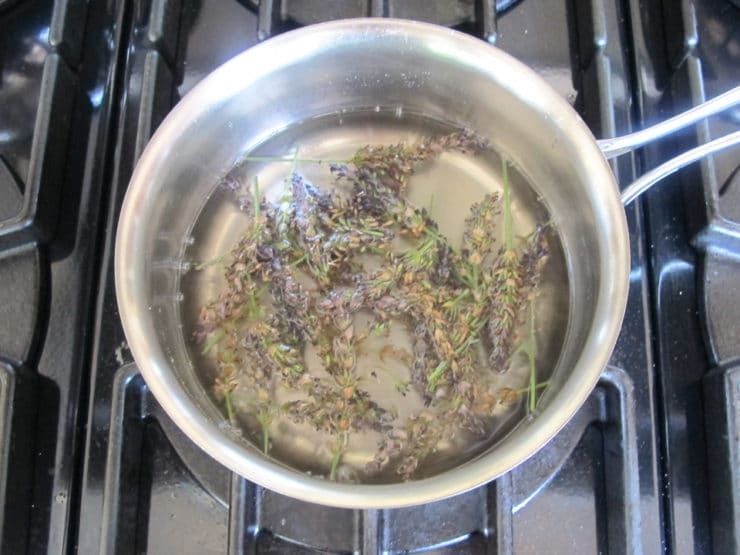 Remove from heat and allow to cool completely, then strain the lavender from the syrup with a mesh strainer. In another small saucepan, boil 2 cups of water. Remove from heat and add tea bags. 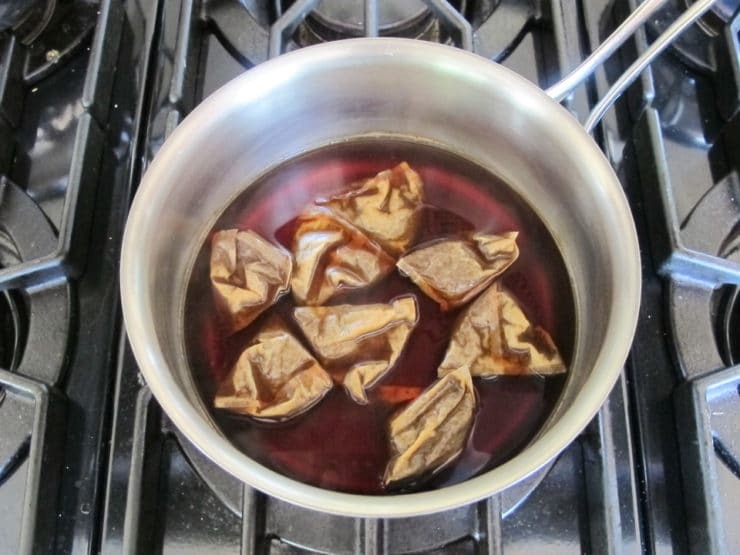 Allow to steep for at least 30 minutes, then remove the tea bags. In a large pitcher, combine the lavender syrup, brewed tea, lemon juice and remaining 6 cups of water. Stir well to combine. You may add additional sugar or lemon juice to taste if desired; as written the drink is only lightly sweetened and refreshing. Chill the pitcher of tea thoroughly. Stir again, then pour over ice. Enjoy! made lavender liqueur with my culinary lavender, not sure how i havent given this a try. Peet’s coffee used to have an Earl Grey tea with Lavender instead of Bergamot, wonder if they still do. I’ve had hot lavender tea and it’s yummy , I’ll try your ice cold tea, I’m a tea lover, thanks Tori for your weekly information. 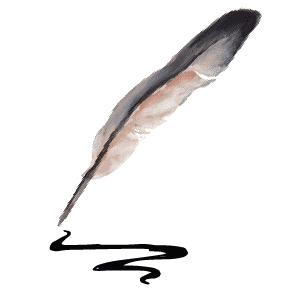 In my youth I was never interested in cooking, now I’m in love with the kitchen and have personal satisfaction cooking, so far all your recipes sound good and inviting, I’ve tried a few and I keep coming back to check and see if I have a new email from you ? keep it coming. I took a cooking class in Canada a number of years ago called “Cooking with Herbs”. We used lavender in a couple of dishes – a fantastic lavender butter, slightly sweetened with maple syrup which tasted amazing spread on fresh baguette slices, and we also used lavender in the shortcake that we made for strawberry shortcake. Awesome!! I will definitely have to try this tea! Oh, and I have a lavender balsamic which is divine with lemon olive oil in a vinaigrette! You refer to the drink as being “only lightly sweetened”. Yet a cup of sugar to 9 cups of water comes out to almost 2 TABLESPOONS of sugar PER CUP of tea! Isn’t that a huge amount of sugar?? People who normally take sugar in their tea or coffee only take a teaspoon or so, no? Do you think it would taste OK with Splenda? Janet, I meant that the end flavor is lightly sweetened. It doesn’t taste overly sweet. You can certainly use Splenda or any other kind of sweetener to taste. If you like it less sweet, use less. Or you can omit the sweetener entirely and simply infuse the water with lavender, then sweeten each glass to taste. Enjoy! I am drinking green tea and honey as we speak, I do love iced tea! I have a bag of lavender from the Half moon bay CA farm. What’s the difference between food grade and farm dried lavender? Can I use what I have?I have used it to make lavender icing for lemon cake. The lavender flavor was very subtle. I spray my bedding with lavender for a relaxing sleep. P.S. Tori, a whole cup of sugar, ? What size serving and how much sugar per serving? Trying to cut down, and not use sugar substute thanks . Hi Iris, the cup is for a whole pitcher so it really doesn’t amount to that much, however you can certainly cut down on the sugar if you’d like, or even use a natural non-glycemic sweetener like stevia. I do like a touch of sweetness here as it enhances the lavender flavor. In terms of food grade lavender, ask your local nursery for a recommendation. Some varieties have a stronger and sweeter flavor than others. Also try to get organic if you can, so it will be free from pesticides. You can use any type of lavender for this recipe, but some strains are particularly suited to cooking due to their enhanced fragrance (like Lavandula angustifolia). tea addict for life. hot or cold all good. Suntea rocks.. I had Thai iced tea with milk in it today. ? where can you get culinary lavendar?? I love tea too!! We enjoy iced tea all year around. Iced tea = Elixir of Life! 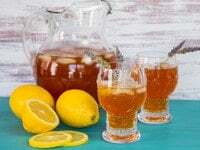 Make sun tea all summer. I love me some sweet taah.